Air raids have targeted the presidential office in Yemen’s rebel-held capital Sanaa, killing at least six people and wounding 30 others, according to medical sources. 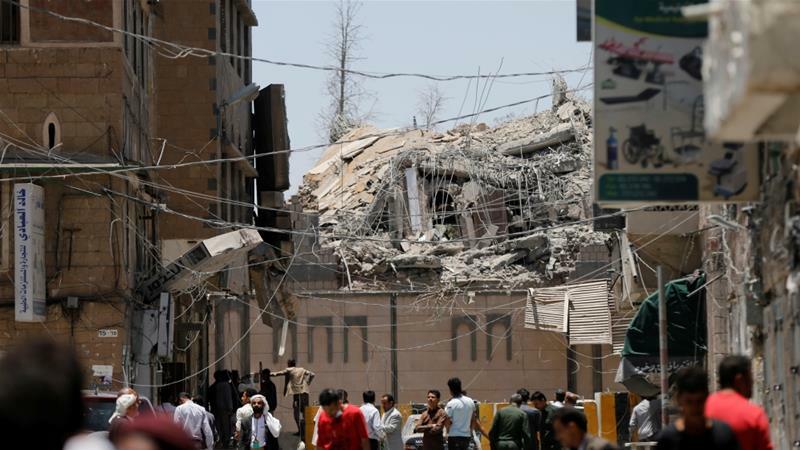 Witnesses said fighter jets bombed Sanaa several times at midday on Monday, with rebel-controlled Al-Masirah television blaming the Saudi-led coalition for the raid. Residents said they heard two explosions hit the building, which is located near a hotel, a bank and several shops, and not far from the central bank, according to AFP news agency. Witnesses said the office, used by the Houthi rebel administration, is normally bustling with employees. “We were working next door to the presidential offices and heard a plane, and then an explosion,” Ahmed Dehashir, a first responder, told AFP at the scene of the attack. “There are a lot of people trapped under the rubble,” Dehashir added. The Saudi-led coalition launched a military intervention in Yemen in 2015 with the goal of rolling back the Houthis and restoring the internationally-recognised government to power. The raid came hours after Saudi Arabia’s air defence systems intercepted two ballistic missiles launched by the Houthi rebels towards the south of the kingdom on Sunday, according to coalition spokesperson Colonel Turki al-Malki. He said the rockets were launched from northern Yemen towards “populated areas” of Saudi Arabia but were intercepted overnight without any casualties or damage. Since November of last year, rebels have intensified missile attacks into neighbouring Saudi Arabia. The conflict in Yemen has left nearly 10,000 people dead, tens of thousands wounded, and millions on the brink of famine in what the United Nations has called the world’s worst humanitarian crisis.